With more patients winning the battle against the disease, it’s more important than ever to address their unique posttreatment needs and ensure they’re receiving the proper care. There are 12 million cancer survivors living in the United States, about 2.4 million of whom are breast cancer survivors. As treatment becomes more advanced and scientists make new discoveries about the disease, these figures will likely rise. We’re living in an age in which cancer no longer means a death sentence, but that fact alone has not led to better postcancer treatment. In fact, many survivors say they are receiving inadequate care following their cancer treatments. For breast cancer survivors, who have very specific medical needs due to heart problems, loss of lean muscle, and bone loss, effective postcancer care is crucial to maintaining health. Fortunately, by applying nutrition expertise and becoming knowledgeable about survivors’ specific needs, dietitians can greatly improve patients’ care. The medical community has focused so much of its efforts on treating and finding a cure for cancer that when an individual survives the battle, he or she is often left in the dark as to what to do next. But as more patients emerge as survivors, it’s becoming increasingly important that attention be directed to their postcancer treatment. It’s a lesson that Diana Dyer, MS, RD, learned the hard way. While focusing on her own recovery, Dyer’s self-education on nutrition and cancer made her an interesting interviewee for a Detroit Free Press article and soon changed the direction of her career. When newspapers nationwide picked up the story, it became obvious just how many other survivors were asking the same questions as Dyer. Due to the efforts of individuals such as Dyer, the “survivorship phase” of cancer is finally starting to get some much-needed recognition. In 2005, the Institute of Medicine emphasized the need for better postcancer treatment in its report “Lost in Transition.” And some cancer centers are forming survivor clinics that focus on the life-after-cancer phase. But many argue there’s still a long way to go. A recent study published in the Journal of Clinical Oncology found that breast cancer patients gave low marks to the postcancer care they received from their primary care physician, who generally serves as patients’ main healthcare provider after they’re released from active treatment with their oncologists. In the study, which included 300 breast cancer survivors, patients reported being unsatisfied with their physician’s knowledge of the late effects of cancer therapies and ways to treat symptoms related to their disease or its treatment. 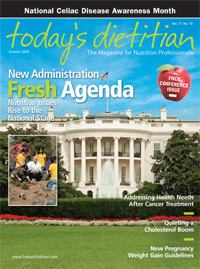 It’s important that dietitians understand cancer survivors’ specific needs. Dyer says the medical community has gotten so good at early detection and treatment that most breast cancer patients will likely die of something else—but that something else may very well be related to their cancer treatment. That’s why cancer nutrition should emphasize more than just cancer prevention, she says. Of course, that’s not to say that dietitians should not also promote a diet to help prevent the recurrence of cancer or the development of new cancer. Dyer simply emphasizes that it’s important not to focus solely on cancer, as there are many other issues a survivor brings to the table. She likes to stress the importance of overall health but does not dismiss the importance of cancer prevention, too. One project currently under development is a series of Webinars that will help guide dietitians through the process of working with cancer patients and survivors. “We also have lectures planned on prevention, nutrition intervention, and survivorship and treatment-specific side effects,” says Huhmann. In addition, field survivorship care plans are in the development and testing phase. This survivorship tool kit will be available through the American Dietetic Association and will include everything a dietitian would need to know to help a client through the survivorship phase of the seven most common cancer diagnoses, including breast cancer. The ON DPG hopes to make the kits available by the winter of 2010. • Doyle C, Kushi LH, Byers T, et al. Nutrition and physical activity during and after cancer treatment: An American Cancer Society guide for informed choices. CA Cancer J Clin. 2006;56(6):323-353. — Both sidebars Diana Dyer, MS, RD. Web site: www.CancerRD.com. Blogs: www.dianadyer.com, www.365DaysofKale.com, www.cancervictorygardens.blogspot.com. © 2009. Permission granted to reprint.